Peter Falk’s Columbo had a heavy patina of grubby naturalism. His raincoat had never seen a dry-cleaner; he was often unshaven and his hair was wild. One of his eyes could look the wrong way—but which eye? His halting speech affected shyness, befuddlement, or hours spent watching John Cassavetes films. He was as unkempt as Hercule Poirot is spick-and-span. But the two characters were equally artificial. I’m not complaining. If I’d done a murder, I’d rather be drawn into serpentine discussions with Falk, and even be arrested by him. He had respect for a wily games player. On the TV obituary for Falk, who died June 23, there was a scene from the long ago where Falk pins down William Shatner because Shatner wiped the gun clean of fingerprints, but forgot to clean the bullets! Whereupon Shatner said something like, “Darn it!”, and snapped his fingers in annoyance as if his elegant passing shot had been called “Out!” Detection with Columbo was always a game, just as the lieutenant was a model of eccentric but infallible intelligence. The marvel was that Falk himself seemed as much at ease with William Shatner as with John Cassavetes. Real policemen aren’t like Columbo, not as polite, actorly, or infallible; and, these days, it’s hard to think of a TV series like Columbo getting off the ground, much less at the 90-minute slot it used to fill. TV murder has gone for violence and DNA traces, with fantastically beautiful female cops doing autopsy and psychotic analysis. The artful working out of narrative intrigue and the gradual music of cross-examination are out of fashion. 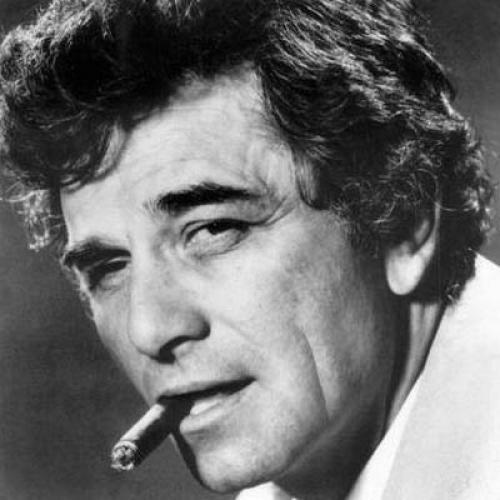 Still, who wouldn’t pay to see and hear Columbo having 20 minutes with Casey Anthony? Columbo started at NBC in 1971, created by William Levinson and Richard Link. It was always shot as a movie, and the first episode had Jeffrey Bochco as its writer and Steven Spielberg as director. The title role itself seems to have been offered first to both Bing Crosby and Lee J. Cobb before Falk seized it—a Jew playing an Italian in the Los Angeles Police Department. It ran until 1977. It won an Emmy as best series, and Falk won one year for best actor in a series. Then, it came back for a while in 1989. In all, there were only 69 episodes, because they were long-form, because Falk was against working too hard, and because the air of deliberation that distinguished the show was an important part of the overall approach. In its glory days, it was a Sunday-night classic in prime time, playing against Kojak, Mannix, and Sonny & Cher. Columbo had a dog sometimes, a rare and beaten-up Peugeot, and he talked about a wife, though she was never named or seen. Falk himself said he believed the wife was a talking point, a Bunbury figure he could use as he drew the suspects into conversation. For the only things in life Columbo needed were a stogie that kept losing its light and a murderer who held his interest. Despite the L.A. setting, a low-life seldom got into the show. The murderers tended to be well-dressed and better spoken, gentry on the slide and movie actors less able to get movie roles. The pattern was dogged. We saw the murder; we knew the murderer. Then, along came Columbo and the fascination of seeing how he would work it out and trap the killer. In truth, he had the attitude and advantage of the script-writer. The show was rooted in the satisfaction of predictability coming true—and that was nearly a motto for the golden age of television, a medium that hastened to calm and eliminate the unsettling spontaneity that was pushing into some movies in the 1970s. So it’s all the more intriguing that, at exactly the same time, Falk was acting in some of the most radical, behavioral films being made in America, open to pessimism and the overthrow of old narrative order. He had been acting since the mid-’50s, and he had a small role in the 1956 revival of The Iceman Cometh. He had two supporting actor Oscar nominations as gangsters—one very nasty, the other more benign—in Murder, Inc. (1960) and Pocketful of Miracles (1961). It was in 1970 that he joined Ben Gazzara and John Cassavetes in Husbands. Four years later, he was the anguished but none too bright husband opposite Gena Rowlands in A Woman Under the Influence. Then, in 1976, he played with Cassavetes in the Elaine May movie, Mikey and Nicky. The strange thing is that the Cassavetes pictures may have been more dated than Columbo (which was an antique when it was made). Falk was a real actor in other films like The Brink’s Job, Wings of Desire, and even the cornball comedy, The In-Laws. But there’s something about Columbo that has increased in charm. It may be the love of talk, elegant plotting, the sly afterthought, and a celebration of cunning intelligence. Narrative can be a form of music, and to see Falk dueling with Shatner is to recall the chess of the show. The people doing Columbo had their favorites, and I’m sure Falk’s opinion mattered a lot. The flamboyant sultriness of Patrick McGoohan (another real star on the small screen, but barely noticed on the big) played a murderer four times and directed five episodes. Robert Culp and Jack Cassidy were often on the show, and other notable guest turns came from Ruth Gordon, Janet Leigh, Roddy McDowall, Ray Milland, Robert Vaughn, and Laurence Harvey. Such villains were closer to Agatha Christie than “The Wire” or “The Sopranos.” But “realism” is seldom more than a style and a fashion. The fact remains that, for a couple of generations, Falk, McGoohan, and Culp were stars and familiars in the way Gable, Tracy, and Bogart had been 25 years earlier. Falk will be remembered as an American archetype, the Holmes type who hides his smarts in shabby homeliness. So it’s sad to report that, in his last years, he was a victim of Alzheimer’s who apparently did not recognize the name “Columbo.” But the rest of us love the guy.